CityFloodMap.Com: Urban Heat Island - A Local Climate Cause for Urban Flooding? Urban Heat Island - A Local Climate Cause for Urban Flooding? As we move ahead, its important to quantify trends in extreme rainfall events, particularly as these relate to urban flooding. Recently Northern Illinois University (NIU) explored the effects of local urban heat island on storms. We review this in the context of trends in Toronto-area extreme rainfall, as well as trends across Ontario and Canada. NIU research suggests that local heat island effects increase the incidence of thunderstorms. They found that for any given day in the 17-year study period (1997-2013) there was about a 5 percent greater chance that Atlanta would experience a thunderstorm compared to a similar sized rural area. As convective summer thunderstorms are the typical cause of urban flood damages, this could be one factor resulting in increased flood damages over past decades. The urban heat-island effect. A landscape of concrete, asphalt and densely packed buildings can enhance heat. Low pressure forms atop the urban area with higher pressure in surrounding rural areas. The scenario might cause low-level atmospheric convergence, which forces air up into thunderstorms. Localized areas of upward moving air resulting from increased surface roughness. A cityscape modifies wind direction and speed, which might lead to enhanced convergence and thunderstorm formation. The Toronto area has been expanding since Governor John Graves Simcoe established the town of York in 1793. For comparison, Metropolitan Atlanta had a population of about 5.5 million in 2013 while the Greater Toronto Area population in 2011 was about 6 million. Is it possible that the urban heat island effects from expanding Mississauga, Brampton, and Vaughan area have increased the incidence of storms over Toronto? since the 1940's in downtown Toronto (Environment Canada). Environment Canada Engineering Climate Datasets show no increasing trends in the severity of storms downtown at the "Bloor Street" gauge as we call it in the business. 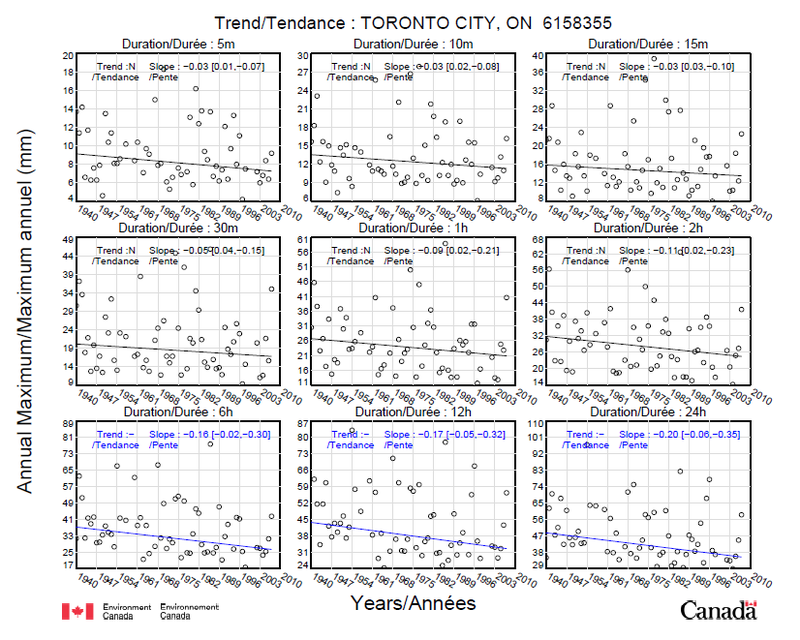 This "Toronto City" gauge trend data is shown to the right. Often the characteristics of severity and frequency are used together. It is reasonable to expect that these move in the same direction when it comes to rainfall events. That is, if there are ever more frequent events, then there is a higher probability that a more severe event can occur. The Atlanta research looked into the frequency of thunderstorm 'births' but did not explore the resulting severity of the events. 5 minute to 24 hour durations. Station 6158665. 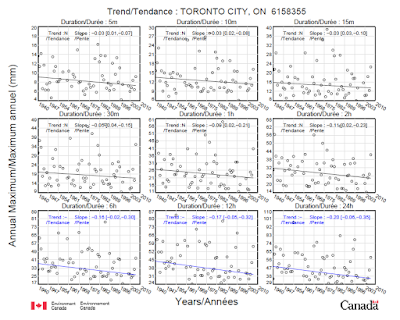 Given that the severity of rainfall events has decreased at the Toronto Bloor Street gauge, we could assume that the frequency of events has decreased as well. Below the Bloor Street data is the Toronto Island Airport and the Buttonville Airport rainfall trends. Both of these locations show decreasing trends in the maximum rainfall depth measured over 5 minute to 24 hour periods each year. Is it possible that the relative stability of the land use around the Island and Bloor Street has meant stable thunderstorm patterns? over 5 minute to 24 hour durations. Station 615HMAK. rainfall over 5 minute to 24 hour durations. Station 6158731. At the Pearson Airport gauge there is a mix in the trends in the maximum rainfall depths. The trend is downward for 5 minute durations and 6, 12 and 24 hour durations, but upward for 10 minute to 2 hour durations. This data set is extended to include the large storm on July 8, 2013. Is is possible that the development sprawing to the north and west of Pearson Airport contrbutes to an increase in the severity of annual maximum rainfall depths at Pearson for some durations? Lot likely. Bear in mind the upward trends some some durations are Peason are minor and that even in a statistically static environment (no change in rainfall severity), trends naturally go up or down as more samples are taken from the underlying 'population' over time - it is just like variable results from a coin toss. You statistically have a 50% chance of getting heads in the long, long run, but you also have a 6% chance of getting 4 heads in a row on your first tosses. As we move past 2013 and clock smaller sub-record breaking events, the Pearson Airport trends may also follow the decreasing downtown and uptown Buttonville ones. The one gauge that has been cited as having experienced many more extreme events over time is the North York gauge. This is actually a composite data record gauge and so it should probably not be given as much weight as Bloor Street or Pearson which have longer records from more consistent locations. 24 hour durations. Station 615S001 (composite gauge). The verdict? Are storms becoming more severe in the Toronto area and could this be caused by urban heat island effects? The answer is storms are not becoming more severe, and we also conclude no more frequent. This means that neither the macro scale effects of global climate change, nor the local scale effects of heat islands, nor the combination of the two, are having a measurable impact on rainfall patterns in Toronto. What has certainly changed in the Toronto area to explain increased flooding? Urbanization has increased runoff and that land use change doubles or triples peak flows relative to rural conditions. The Don River watershed urbanization has increased from 15% in the 1950's to nearly 90% today. Also, overland flow paths have been enclosed or obstructed due to intensification and infill. Perhaps Ontario needs a "Places to Flow Act" to address deficiencies in the overland flood conveyance capacity in developing cities. of rainfall accumulation (anything above a trace amount). Numbers are up but do not affect flood risks. Several insurance companies have cited annual precipitation, or number of rainfall events per year as a factor in increasing flood damages, but this is really nonsense. Understandably, urban flooding is a complex issue and annual precipitation would be a convenient explanation for it. It is short term rainfall intensities as shown the in Environment Canada charts above that define urban flood risks. "Days with rain" is risk factor for mushroom growth on your front lawn. We explore that in another post. Ontario decreases and increases in short term rainfall intensities. expectations that return period rainfalls will all show INCREASES"